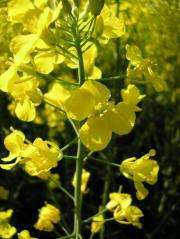 Rapeseed is one of the ten most important agricultural crops worldwide. In spring, the rapeseed fields with their bright yellow flowers are widely visible: this year winter rapeseed is being cultivated on 1.46 million hectares in Germany; at least 2.2 million tons of rapeseed oil can be expected. Beekeepers set up their beehives in the vicinity of rapeseed fields, so that the worker bees can gather nectar This ensures that the rapeseed flowers are pollinated and a high crop yield will be obtained. During her studies, a scientist from the Max Planck Institute for Chemical Ecology has discovered that the plant hormone jasmonic acid - known as a signalling molecule after herbivory - not only regulates flower development in the bud stage, but also triggers nectar production. Jasmonic acid and related molecules are constituents of molecular signal transduction chains in plant tissues. These compounds - generally referred to as jasmonates - are synthesized when caterpillars feed on plants; they are signaling substances and belong to the group of plant hormones. By producing jasmonates the plant regulates its defense against herbivores e.g. by stimulating the synthesis of toxins. Moreover, previous studies have shown that jasmonates regulate the production of "extrafloral nectar". This particular nectar, which is produced by special glands called "extrafloral nectaries", has nothing to do with pollination, but attracts ants to the herbivore-attacked plants as defenders against their pests. The sugars in the nectar reward the ants for defending the plant. The same principle applies to floral nectar: nectar production in the flowers attracts and rewards pollinators which in turn contribute substantially to the seed yield. However, up to now, it has not been clear how nectar production is regulated in the flowers. Radhika Venkatesan, PhD student at the International Max Planck Research School in Jena, studied Brassica napus, a widespread and agriculturally important plant species. She found that when its flower tissues produced jasmonates during an early developmental stage, nectar production was immediately activated, regardless of whether the plant had been attacked by herbivores or not. "When we put caterpillars on the rapeseed leaves to elicit jasmonic acid production, the nectar secretion of the flowers was not affected," the researcher says. Spraying jasmonic acid on the green leaves also did not have an impact on the production of nectar in the flowers. However, when the scientist sprayed jasmonic acid directly on the flowers, nectar production increased dramatically. This clearly indicates that jasmonic acid has different functions in the different plant tissues: whereas the hormone activates defense mechanisms against herbivores in the leaves and the shoot of the plant, it regulates nectar production in the flower tissue. The correlation between the production of jasmonic acid and nectar accumulation was demonstrated in experiments with an inhibitor: if the flowers had been treated with an inhibitor of jasmonic acid synthesis, the so-called phenidone, nectar production failed. If the substance was sprayed on young, still closed flower buds, however, their opening was inhibited, which confirms the importance of jasmonic acid also during the development of the flowers. "The fact that jasmonic acid regulates so many functions, such as plant defense and pollination, is extremely interesting and raises new questions, especially concerning the evolution of these control mechanisms," says Martin Heil, the leader of the study. Wilhelm Boland, director at the Max Planck Institute in Jena, emphasizes: "The more we know about the hormonal effects on flower development and nectar production in agricultural crops like rapeseed, the better we can use this knowledge to ensure high yields." Even beekeepers could benefit from increased nectar production.